WASHINGTON, D.C., Oct. 1, 2018 ‒ This the 15th annual National Cyber Security Awareness Month (NCSAM), an extensive online safety awareness and education initiative co-led by the National Cyber Security Alliance (NCSA) and the U.S. Department of Homeland Security (DHS). Each week throughout the month will highlight cybersecurity awareness by examining a specific theme. Focus areas include practicing good cybersecurity at home; building a capable cyber workforce; establishing a strong culture of cybersecurity at work and safeguarding the nation’s critical infrastructure. NCSAM efforts fall under the umbrella of Our Shared Responsibility, which recognizes that we all need to do our part to help protect the internet: when we do so, we make the internet safer for everyone. Underscoring this notion, NCSA invites you to view a special message from William O’Connell, a chief business security officer at ADP® and chairman of the NCSA Board of Directors. In addition, NCSAM 2018 will shine a spotlight on the critical need to fill the millions of rewarding jobs in cybersecurity. You can actively support NCSAM, too, by becoming a Champion. All organizations and individuals are encouraged to sign up. NCSA is excited to announce that Intel is joining on to support NCSAM. Intel’s innovation powers the smart and connected digital world. Like a Champion, Intel will remind users that keeping computer software, applications, and systems updated helps maintain a safer computing environment for us all – at home or at work. Signing on is easy and does not require any financial support. Learn more here: https://staysafeonline.org/ncsam/ncsam-champions/. Today, many households have parents, toddlers, tweens, teens, and grandparents living under one roof. Each of these age groups is likely to have unique awareness levels and online habits. With consumer interest in smart home products increasing – 48 percent of U.S. consumers intend to buy at least one smart home device in 2018 ‒ ongoing education for all generations is critical. It is important to note that in spite of the spike in potential product purchase, there is great concern among consumers about privacy and security. By continuously learning about and practicing good cybersecurity at home, the entire household and online community at large will reap the benefits of a more secure, connected world. Whether younger children are playing with their connected toys, mom is adjusting the thermostat remotely, or teen-age kids are engaged in social media, everyone must learn how to use the internet responsibly. Below is some tried-and true-advice to keep in mind when examining different groups and their knowledge base. Every child is taught basic safety precautions, like not talking to strangers and looking both ways before crossing the street. Teaching young kids easy lessons for online safety and privacy begins with parents leading the way. Click here for positive, age-appropriate advice that will set the course for a happy online life. As tweens and teens begin to rule the roost ‒ fully experiencing life online, connecting with friends and playing games ‒ it is important for them to continuously take safety measures, think about the consequences of their actions and connect knowing they are doing their best to protect their reputation. The share of American adults who own smartphones is now at 77 percent – up from 35 percent in Pew Research’s survey of smartphone ownership. In fact, one-in-five Americans are now “smartphone only” internet users at home. These devices contain significant information about you and your friends and family, including contact numbers, photos and locations and must be protected. Learn how to keep smartphones and other mobile devices safe and secure: https://staysafeonline.org/stay-safe-online/securing-key-accounts-devices/mobile-devices/. There has also been significant tech adoption in recent years among older generations – particularly Gen Xers and Baby Boomers who can now stay in touch with family and friends nationwide and across oceans. Learn more here: https://staysafeonline.org/stay-safe-online/managing-your-privacy/privacy-tips-older-adults/. This week, and throughout October, follow these STOP. THINK. CONNECT.™ tips for a safer and more secure digital life. 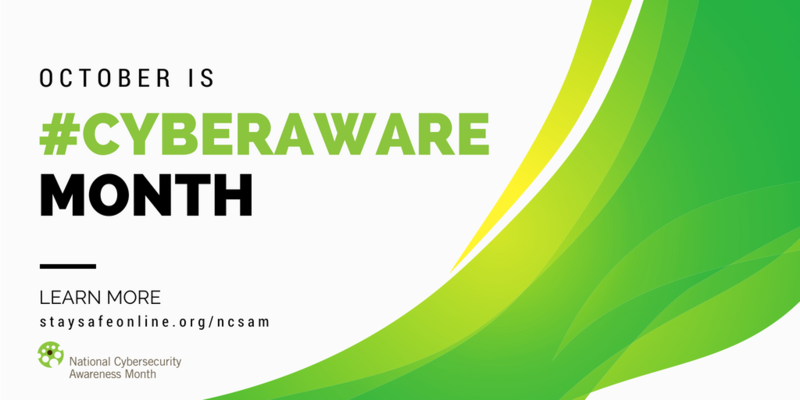 Additional easy-to-follow information is also available in the NCSAM 2018 infographic (hyperlink) – download and/or share on social media using the hashtag #CyberAware. Lock down your login: Your usernames and passwords are not enough to protect key accounts like email, banking, and social media. Strengthen online accounts and use strong authentication tools like a unique, one-time code through an app on your mobile device. Keep a clean machine: Keep all software on Internet-connected devices – including personal computers, smartphones, and tablets – current to reduce the risk of infection from ransomware and malware. When in doubt, throw it out: Links in email, tweets, posts and online advertising are often how cybercriminals try to compromise your information. If it looks suspicious, even if you know the source, it’s best to delete or, if appropriate, mark as junk. Back it up: Protect your valuable work, music, photos, and other digital information by making an electronic copy and storing it safely. If you have a copy of your data and your device falls victim to ransomware or other cyber threats, you will be able to restore the data from a backup. Personal information is like money. Value it. Protect it. : Be thoughtful about who gets that information and how it is collected. Use #CyberAware and share a tip on social media. Sign up as an NCSAM Champion. Join our weekly #ChatSTC Twitter Chats each Thursday in October at 3 p.m. EDT/Noon PDT. STOP. THINK. CONNECT.™: View The Internet’s Most Wanted video. Don’t Let Your Social Network Profile Get Hacked! How to Spot a Bogus URL! Pew Research Center’s new report finds that 59 percent of U.S. teens have personally experienced at least one of six types of abusive online behaviors. The most common type of harassment teens encounter online is name-calling; indeed 42 percent of teens say they have been called offensive names online or via their cellphone and 32 percent of teens say someone has spread false rumors about them on the internet. Fully 90 percent of teens believe online harassment is a problem that affects people their age, and 63% say this is a major problem. But majorities of young people think key groups, such as teachers, social media companies and politicians are failing at tackling this issue. By contrast, teens have a more positive assessment of the way parents are addressing cyberbullying. These findings are drawn from surveys of 743 teens and 1,058 parents living in the U.S. conducted from March 7 to April 10, 2018.